I live in Gainesville, Florida. Gainesville is a college town and is the home of The University of Florida. The general educational level of people in this community is rather high. Gainesville has a number of churches but they tend to be rather liberal or mildly evangelical. Hard-core fundamentalist religion is rare here, but it does exist. Our most fanatical fundamentalist church is a charismatic congregation called The Dove Outreach Center Church. 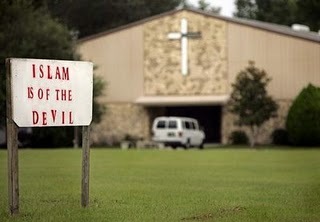 They have posted signs in front of their building that read: "Islam Is Of The Devil ." When members of Fred Phelp's Westboro Baptist Church came through town to do their rude, crude protests outside places of worship, they were universally condemned by the our local liberal and conservatives churches, but there was one exception: The Dove Outreach folks joined with the Westboro loonies in their protests! On July 4th, I was driving down University Avenue here in Gainesville and I was surprised to see a crowd of protesters standing in front of the Islamic Center holding up all kinds of derogatory and inflammatory signs that had messages on them "Islam Is Of The Devil," "Jesus Is The Only Way," "Islam the New Nazism," "Incorrect Tolerance Destroys Our Nation," "Shariah Law is Evil," "Stop Islamic Terrorism," and "Obama is a Moslem". I stopped my car walked over to talk to them. I wasn't angry at them; actually, I was actually bemused by their actions. I understood where they were coming from because thirty years before, I had their same mentality. I got into a lengthy discussion with one of their young ministers by the name of Dave. He was well spoken and struck me as someone who had some intelligence. I could see my former self in him: earnest, sincere and truly believing that what he was doing was meant to help people find "truth". I know folks like these cause the blood of free-thinkers and humanists to boil, but I actually felt compassion for them. I viewed them as being trapped by their lack of knowledge, education and as persons who had been subjected to a ton of fear, paranoia and guilt by the pastor of their church. They are doing what they are doing because they lack understanding. I saw their protest as an opportunity to "come let us reason together." I introduced myself to Dave and told him that I was an ex-Pentecostal preacher, that I had a degree in Bible from a pentecostal liberal arts college, and went on to obtain a seminary degree. I informed him that thirty years before, I would have readily joined in the type of activity they are doing. I calmly told him that I knew that they were "sincere" in their beliefs. I started off by following these words by confessing that when I had their outlook I thought I knew a lot but I discovered that I actually did not understand the Christian faith I so confidently proclaimed at that time. 1. I knew that to his faith, having it based on the Bible is basis for all his beliefs and actions and that he believes "God" gave us The Bible as his final word for what we are to believe and how we are to behave. I told him that I discovered in my studies that the Christian church has never agreed on exactly what is "the Word of God". The Protestants have their version; the Roman Catholic have their canon; the Ethopian Coptic Church - which is one of the oldest Christian churches - also have their own unique canon. Why didn't God give us a clear cut body of sacred scripture? I urged him to study the historical processes involved in developing the Bible and he would find that exactly what is "the word of God" is more difficult to ascertain than he ever imagined. 2. This issue of the problem with the authority of the Bible then becomes murkier when it comes to the development of what Christians are suppose to believe. I urged him to read a good indepth history of the first four centuries of the Christian church: "What you will discover is that those early Christians debated and fought over every issue that Christians today believe had always been settled. The early Christians fought over who is Jesus, his nature, his resurrection, what his death meant." Dave responeded by saying that those differences were due to those heretical groups which were not "orthodox" in their doctrine. I responded by saying that what became "orthodox" doctrine was due in large part to which group got the ear of the king, who then enforced a standardization of Christian belief and practice. Those groups who did not conform had their churches burned and priests executed. And again, a good close reading of early church history will show that politics - and not God - played a huge part in how we come to view what is right doctrine and what is considered heretical. 3. The ethical contradiction of a supposedly all loving God setting up a plan of salvation in which 99.99999999% of humanity will not make the grade and will spend all eternity being tortured w/ hell-fire, makes no sense at all: "Couldn't this loving heavenly father come up with a better salvation scheme that insures people get 'saved' instead of one in which people are largely assured to be damned?" I told Dave that I considered myself a compassionate person, and that as a fundamentalist believer I was told that God's love is so much greater than any love I could ever muster towards another; but then I pointed out to him that I would never want even my worst enemy to spend all eternity writhering in pain from an eternal burning fire. Does this mean that me, a mere human, has more love and compassion than almighty God? 2. The gospels don't agree. The picture presented of Jesus in the "synoptic gospels" of Matthew, Mark and Luke is different that the Jesus who is presented in The Gospel of John. In the Synoptics, just who Jesus is is ambiguous. Jesus does not answer directly what his relationship to "the Father" exactly is. However, in The Gospel of John, Jesus is reported to have told those who asked who he is that: "I am the way, the truth and the life; no man comes to the Father but by me." The Gospel of John is chocked full of great versus used by evangelicals, but it more than likely contains the least amount of authentic historical material than any of the gospels. 3. The images of God contradict each other. In the Hebrew Bible (Old Testament), we see that God is capricious in "His" decisions; gets easily pissed off at "His" creatures and has a black-and-white attitude towards fixing problems: kill them all and lets start over! Whereas, Jesus presents images of the "God" as a more caring and loving parent. This shows that "God" has changed over time. 4. I closed out my own humanistic testimoney/critique by saying that the Bible reflects the primitive times in which it was written; and though it has some great words of wisdom, and in places some useful ethical insights, it is to diverse and contradictory to be considered the result of a supposedly perfect, all-knowing mind of one being (unless that being could be diagnosed as having a thought disorder). I also encouraged Dave to go study at an actually accredited university and not attend "Brother Joe's Bible College" and to think that by attending such an institution that he has all he needs to know about the bible and the Christian faith. I also offered that he and I go have a cup of coffee and discuss these issues more. One thing that struck me was that Dave listened to my comments. He offered his own reasons, but our conversation was civil. I intentionally tried to not display any hostility, sarcasm or personal dislike towards him for his beliefs. I like to think that he was open to what I was saying and that my comments were hitting home. I'm hoping he will contact me and we can talk further and have that cup of coffee. ExChristian.Net: Doing Humanistic Evangelistic "Ministry"